One thing went through my mind during the first ten minutes of St. Vincent. This is something of a ‘passing of the torch’ film for Ghostbusters. Hear me out. With the upcoming remake/reboot/spawn-of-cinematic-satan being cast recently and my mortal enemy Melissa McCarthy announced as the ‘lead’, it felt unusual seeing her on-screen with a bitter old Bill Murray. After years of refusing to be involved with any continuation of Ghostbusters (not including his fantastic Zombieland cameo), Murray is reportedly not involved with this new one in any capacity. 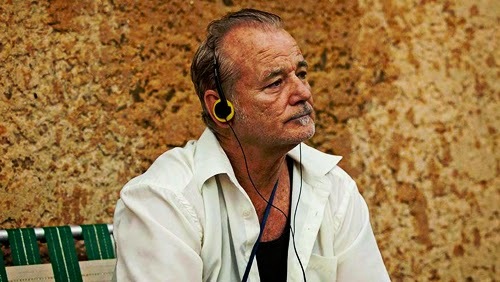 Watching St. Vincent, I felt like he was playing an old drunk retired Peter Venkman and his initial resentment of McCarthy’s character was because she was part of the new ghost busting team. Hey, if it’s the closest we’ll get to seeing him as Venkman again - I’ll take it. But before I could take this fun any further, I actually got absorbed by this cheesy and predictable little film. Much to my surprise, there is a lot to like in St. Vincent. I’ll try and keep how against the new Ghostbusters I am out of the review…no promises. Out now on Blu-Ray and DVD, St. Vincent tells the story of a young boy named Oliver whose parents have just divorced. Bullied at school and neglected by his busy parents, he finds an unlikely mentor and friend in the hard-drinking, chain-smoking, cantankerous Vincent MacKenna. As their friendship develops, Oliver learns more about Vincent and the true heart of gold he has hidden beneath his gruff exterior. I know, it’s a story we’ve seen before many times. The film doesn’t tread any new ground and there’s no major surprises in store. But you know what? I had a good time with it. Who doesn’t love Bill Murray? Nominated for a Golden Globe for the performance, he’s on superb form and the best he’s been since Lost in Translation. While the film was originally written with Jack Nicholson in mind (who rejected it), Bill Murray feels like a perfect fit for the role. His sarcastic charm, arguably his trademark, is given a slightly meaner and bitterer undertone than he gave us with his characters of the 1980s. Whilst he primarily spends the first hour of the film being Bill Murray, he really shines in the moving second half. But without Murray, the film would fall flat on its face. The rest of the cast is rather mediocre. As stated at the beginning of this review, I’m no fan of the ridiculously typecast Melissa McCarthy. She seems to play a loud, obnoxious, vulgar woman in everything. Bridesmaids, The Heat and Tammy are but a few of her recent contributions to cinema that made me want to cry. But credit where credit is due, she is on decent form here, delivering a toned-down performance as a busy single mother. But knowing she actually can act when she tries just makes me even MORE angry at her, for wasting her talents on shite comedies. Chris O’Dowd seemed crow-barred in for the sake of it with nothing to give to the film except a couple of Chris O’Dowd-y scenes. And Naomi Watts plays a pregnant Russian prostitute…Um…I’ve nothing to say on that matter. St. Vincent isn’t perfect. Theodore Melfi, who also directs his debut here, provides a script almost overflowing with clichés and predictability, and the film occasionally doesn’t know who its audience is. Some scenes are very mature and feel adult-aimed; others seem plucked right out of a Disney TV movie. Cheesy indie music fills several scenes of our mismatched friends becoming closer – so cheesy infact that viewers with a lactose intolerance should beware. But as the film went on, I let it go. And I’ll admit, I was genuinely moved by the second half. I could see each twist and turn coming a mile away but they were well executed for the most part – for an indie; when this film worked, it really worked. So, to conclude, St. Vincent is ridiculously predictable and it’s nothing you haven’t seen before. But with films like this, who cares? It’s not trying to be anything other than what it is – a nice, light-hearted bit of easy watching for an evening in. Despite being nominated for a couple of Golden Globes, this isn’t a film that’s out to win awards or satisfy intellectual critics. If you want something like that, you’re in the wrong place. But sometimes we need a nice relaxing two hours in front of the TV without having to pay too much attention. St. Vincent is pretty good for that. Oh…Did I remember to mention I’m NOT on board with the new Ghostbusters? St. Vincent says his prayers and earns a holy 3/5.